As much as many 2019 and 2020 prospects across the country and landing on various radars collegiately, there are a number of sleepers, late bloomers, or simply below the radar 2018 prospects that are doing much of the same right now. One such talent is senior lead guard Matthew Todd of Monticello (MN) who is off to a torrid start this season. A sharpshooting 6-1 165 pound lead guard who checks all the boxes academically, Todd was stellar in spurts this past spring and summer as a standout for the Minnesota Comets Elite program. 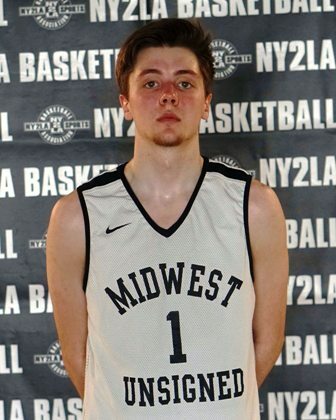 Equipped with a lethal stroke, handles, instincts, vision, and the ability to score at multiple levels Todd was consistently solid game in and game out throughout the spring and summer capturing attention from some Division 1 and Division 2 schools in the process. A late blooming guard, Todd has continued to build off that stellar play during the high school season where he ripped off a 45 point effort while draining 7 trey balls in a victory last week. Not just a one trick pony so to speak, Todd also kicked out 6 assists and collected 6 rebounds in helping his team to victory. With schools continuing to turn over various rocks in search of talented 2018 prospects still on the board, Todd is continuing to open eyes as one of the best kept secrets in the upper Midwest. Cornell, New Hampshire, Nebraska-Omaha, Lafayette, Dartmouth, Montana State, Elon, Wofford, and Stetson are all kicking the tires right now on Todd. Having watched Todd firsthand this past spring and summer one thing that’s for certain is someone is going to get a very good basketball player that a lot of schools slept on before it’s all said and done. Expect Todd to continue to deliver big numbers this season as he’s easily one of the best kept secrets still on the board in the upper Midwest in the 2018 class.